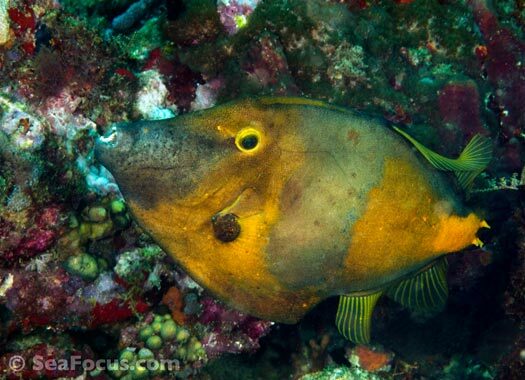 Filefish are sometimes called leatherjackets, a somewhat inappropriate name, as it was their rough skin which inspired their common name. 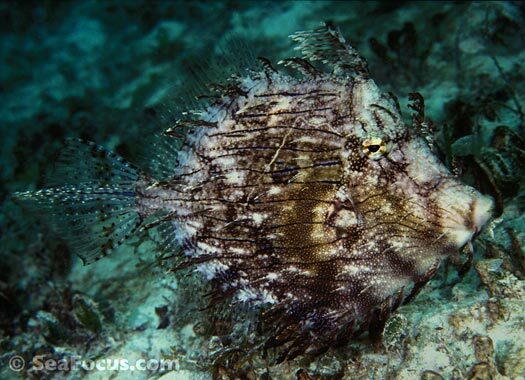 Dried filefish skin was once used to finish wooden items. 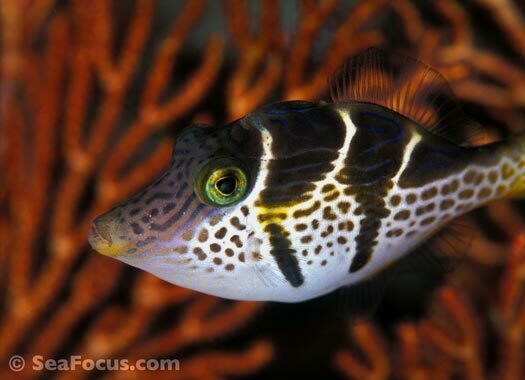 Filefish are found in the tropical and subtropical waters of the Atlantic, Pacific and Indian Oceans. 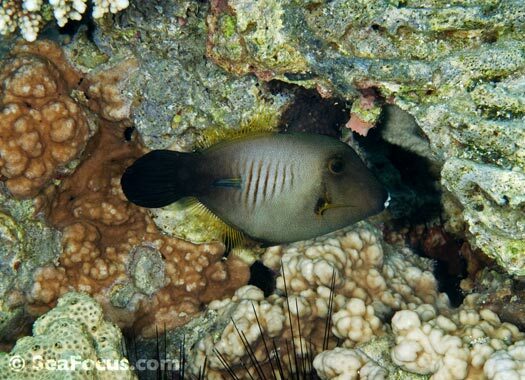 They are closely related to triggerfish, boxfish and pufferfish but unlike these close relatives have flat, almost 2-dimensional bodies with small pectoral fins and truncated, fan-shaped tail fins making them very poor swimmers. 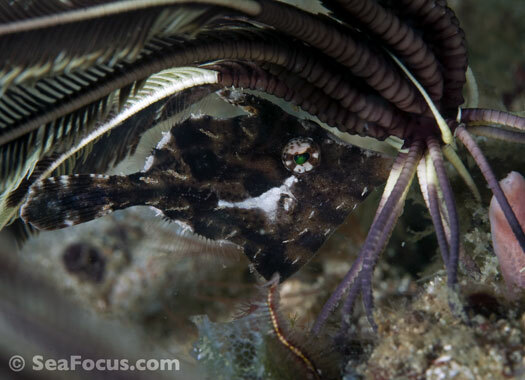 However, this odd, flattened shape is also their main advantage – showing their flank to a predator makes them appear much larger than they are while their side-on, narrow profile allows them to almost disappear. 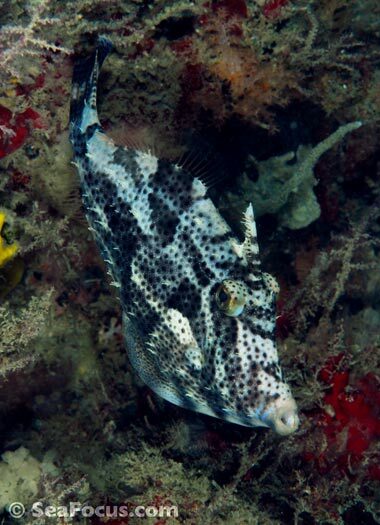 The various filefish species also use their vibrant body patterns, colours and decoration to merge with their background. 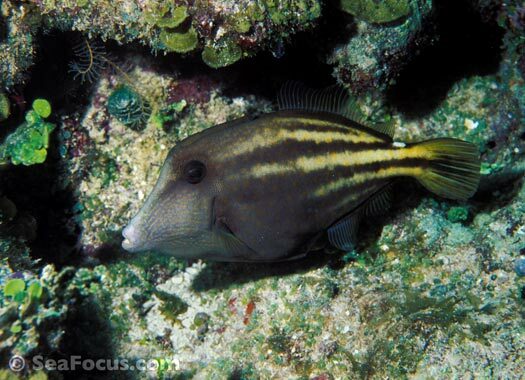 These small fish are found in a wide variety of marine environments from coral reefs and lagoons to seagrass beds and even in the mouths of river estuaries. 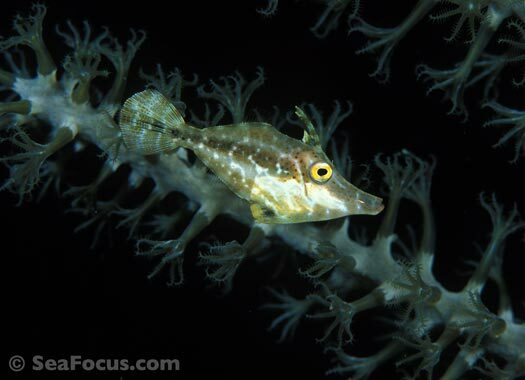 The largest filefish species is the scrawled filefish, which is seen on coral reefs and can grow up to 110 centimetres (43 in) in length. 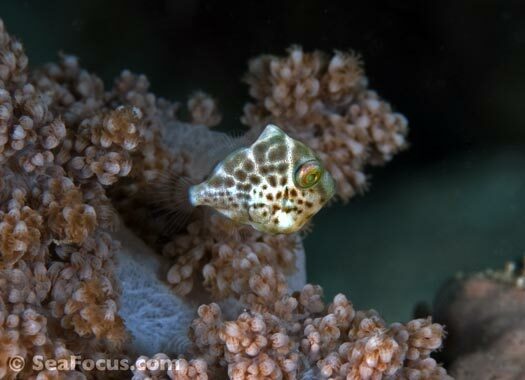 Filefish spawn on sites that are close to the seabed. 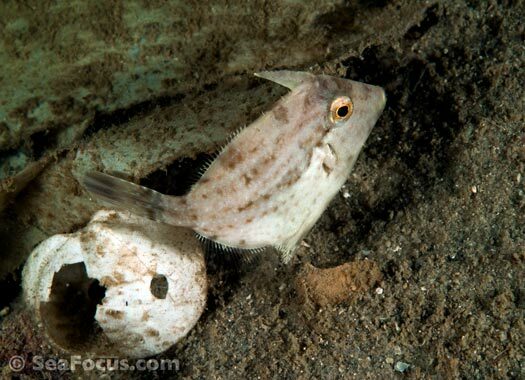 The male prepares the site then, depending on the species, will either guard it alone, or with the female, until the young filefish hatch and take off into open water. 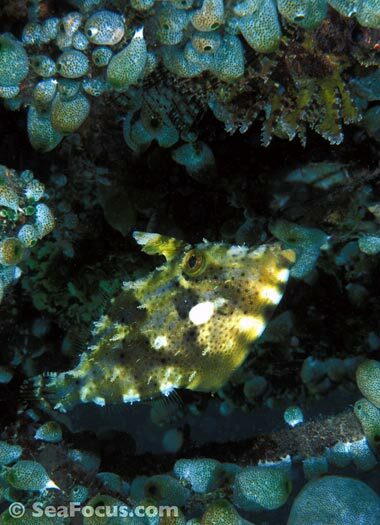 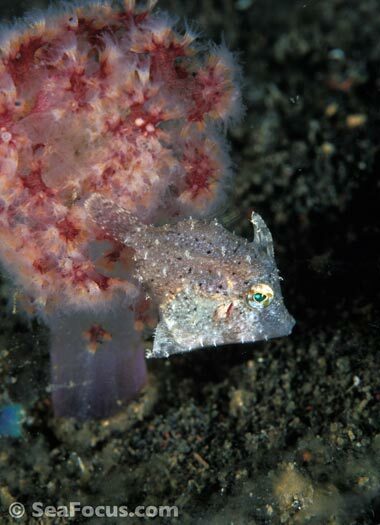 The IUCN Red List lists several species of filefish as either 'data deficient' or 'least concern'. 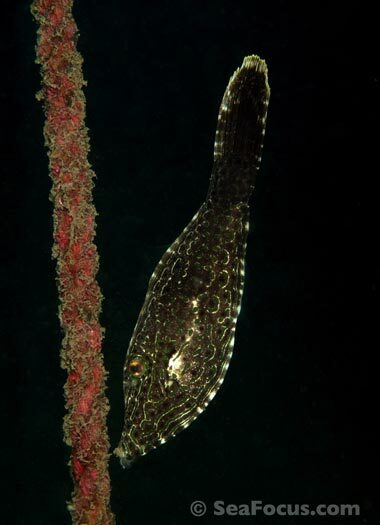 There was a frisky current pushing in from the Lombok Channel. 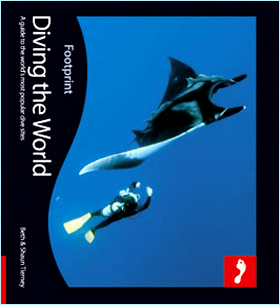 It ripped throughout the dive from the moment we dropped in right until we ascended. 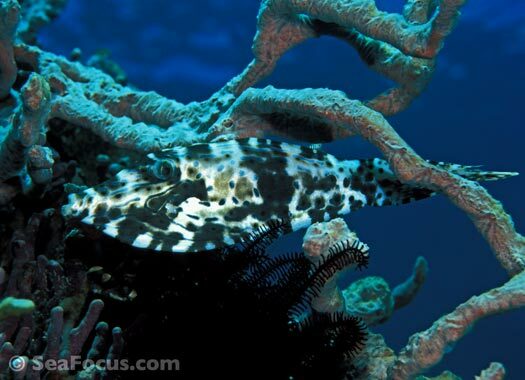 It was a shame as there were a lot of creatures and some beautiful corals but we could hardly stop to admire them. 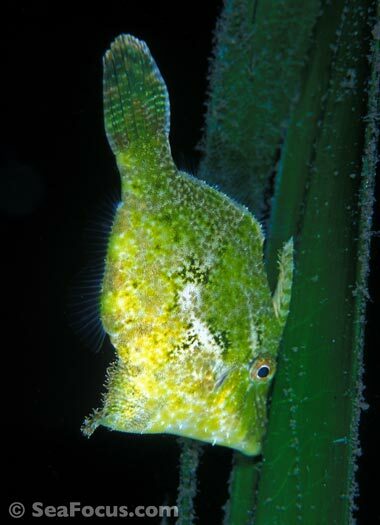 The seabed was covered in tiny soft corals, sponges and lots of crinoids, each hiding a critter that was also sheltering from the current – mantis shrimp, cuttlefish, pufferfish, tiny lionfish and this gorgeous whitebar filefish making the most of a matching crinoid.